Researchers discover new molecule responsible for ovarian cancer proliferation and drug resistance. Thousands of women are living with ovarian cancer in Canada. It is estimated that this year, 2,800 Canadian women will be newly diagnosed with this disease. Even though ovarian cancer continues to be one of the most serious women’s cancers, there is a real lack in reliable early detection tests and few treatment options. Now, researchers at Lawson Health Research Institute have uncovered an important new target for ovarian cancer therapy. Contrary to previous research this new study found that LKB1, a molecule that regulates the metabolism of many adult cells, is an important molecule in the cancer’s promotion and survival. The opensource study is published in the journal Oncotarget. Previous studies show that by the time of diagnosis the majority of women with ovarian cancer already have extensive spread of the disease which makes it difficult to treat by surgery or chemotherapy. According to the team, what is even more concerning is the propensity of the disease to keep coming back until it is eventually resistant to therapy. In order to find out how and why ovarian cancer cells grow and take on such lethal characteristics the current study used cancer cells grown in 3D structures, called ‘spheroids’, the same way the cancer cells grow in patients. The researchers explain that spheroids are sticky and can attach themselves to different organs, such as the uterus, liver, stomach or small intestine. They go on to add that here they can sit dormant and unnoticed for months or years before growing and becoming resistant to chemotherapy. Recently, the lab discovered that the spheroids activate a ‘stress signal’, and the major molecule controlling this signal is called LKB1. Previous studies showed that LKB1 was a tumour suppressor in ovarian cancer, meaning that tumour cells need to get rid of LKB1 to cause cancer. However the current study is in direct conflict with these earlier studies as the data findings definitively show that ovarian cancer cells still have LKB1 and that this molecule allows ovarian cancer spheroids to change their metabolism, promote tumour cell survival and make them more resistant to chemotherapy. The researchers surmise that by refuting these previous studies they have uncovered a new target for future therapy. They go on to add that there are currently no therapies or drugs that target LKB1. Based on these findings the lab is now exploring several different strategies to understand and target LKB1 and its related molecules in ovarian cancer spheroids, and developing the essential pre-clinical models to see if this can be translated to ovarian cancer patients. Proposed divergent roles for LKB1-AMPK signalling in metastatic ovarian cancer. Ovarian cancer metastasis occurs via direct dissemination of primary tumour cells into the peritoneal cavity. Single cells in suspension will readily undergo detachment-induced apoptosis, or anoikis, but the formation into multicellular aggregates called spheroids protects them from cell death. Spheroids possess an enhanced ability to reattach onto the serosal surfaces of peritoneal organs upon which the ovarian tumour cells make a “dormant-to-proliferative switch” and grow to establish secondary metastases. 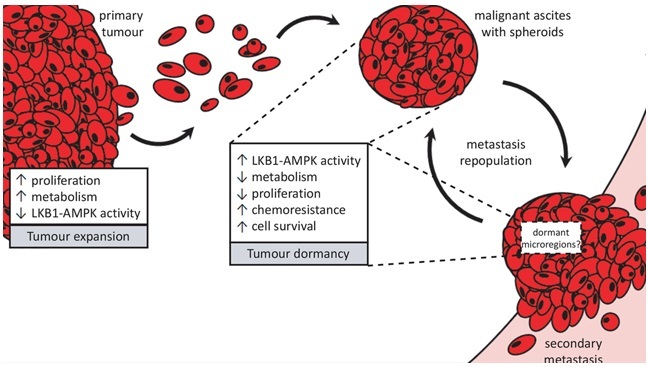 Rapidly-expanding tumour growth (whether in the primary tumour or metastases) would require reduced LKB1-AMPK signalling to allow for increased cell proliferation and anabolic metabolism. Spheroids, on the other hand, adopt a number of pathobiological changes which we propose contribute to their dormant phenotype and facilitate cell survival during metastatic transit in suspension. Our new results support the role for active LKB1-AMPK signalling contributing to ovarian cancer cell dormancy in spheroids by reducing energy metabolism and cell proliferation, yet promote cell survival and carboplatin-resistance in EOC spheroids. Intact LKB1 activity is required for survival of dormant ovarian cancer spheroids. Shepherd et al 2015.